Le Côté de Guermantes (The Guermantes Way), the third part of Marcel Proust’s À la recherche du temps perdu (In Search of Lost Time) has the story continuing pretty much as it did in the first two parts. Our narrator, Marcel, is now a little older (if not much wiser) and still keen to make the acquaintance of any attractive woman who crosses his path. Much of the first part of the book is spent describing his friendship with aristocratic soldier Robert de Saint-Loup and a visit Marcel makes to his camp, mainly with the object of getting an invitation to dinner with Saint-Loup’s aunt, the Duchess of Guermantes. A ma proposition le visage souriant et rose d’Albertine, sous un touquet plat qui descendait très bas, jusqu’aux yeux, sembla hésiter. Elle devait avoir d’autres projets; en tout cas elle me les sacrifia aisément, à ma grande satisfaction, car j’attachais beaucoup d’importance à avoir avec moi une jeune ménagère qui saurait bien mieux commander le dîner que moi. Luckily, this all blows up in his face as, in one of the best parts of the book, he prepares for what he hopes will be a night of passion only to have his potential conquest cancel at the last minute. And then he cries. Que Mme de Guermantes fût pareille aux autres femmes, ç’avait été pour moi d’abord une déception, c’était presque, par réaction, et tant de bons vins aidant, un émerveillement. In truth, Marcel’s obsession involves the family in general, not just Oriane. He enjoys being invited to dinner, and treated kindly, by the selfish, urbane duke, and mingling with the high society making up the numbers at their evenings. There’s also the slightly creepy interest taken in him by the duke’s brother, Monsieur de Charlus, who has become even more obsessive since their meeting in À l’ombre des jeunes filles en fleurs. Being the snob that he is, Marcel is happy to soak it all up, as much in love with the name and all the history it suggests as with any particular person. Overall, while a struggle in places, the book was certainly worth the effort. It’s all beautifully written, seamlessly flowing from one event to the next and, after hundreds of pages of dinner-party banter, Proust even manages to spring a completely unexpected cliffhanger when an old friend makes a sudden confession. So, the question is whether I should move straight on to Sodome et Gomorrhe (Sodom and Gomorrha), the fourth part of À La Recherche du Temps Perdu, or leave it until the French-reading part of my brain has recovered. There is something to be said for reading the first part of S&G straight away as it flows quite nicely from GW. For me, GW was the least interesting and it was the only point at which I did consider giving up on it. S&G is one of the best IMO. That’s good to know, because I stalled after book two and really need to get going with book 3. If I know it’s going to be the hardest, at least I’m forewarned! 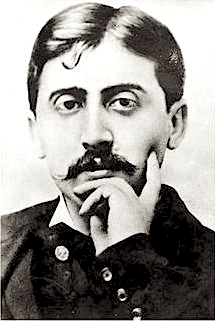 I found with Proust that I had to read him slowly, when I felt like it, and not to force my reading, to re-read parts if necessary. I read it over a year with a GoodReads group and enjoyed it and it changed my reading patterns. I intend to read it all again someday. The parties in Guermantes are deadly. I’ll warn you, after a rather different and extremely interesting start, Sodom and Gomorrah features another 100-page party. Aargh! I must admit I found Sodom and Gomorrah the most tedious of the books to get through. It’s interesting to see sexuality, and LGBT topics specifically, addressed so directly in a 100-year-old text, but some of the commentary reads more like a Carry-On movie than one of our greatest literary monuments. There is a scene based on a misunderstanding of someone asking “are you one of them” that Frankie Howerd would be proud of. But volumes 5-7 are simply magnificent – so please do persist. I titled my piece on this one with the quote “Oriane is a snob” in part because one of the bits I enjoyed in it (and it is sometimes a trudge as you say) is the narrator’s growing enchantment and obsession with Oriane only for him to eventually realise she’s a massive snob and a complete hypocrite. You do remind me that I need to get on to the next volume. Ganbatte Tony-san! Perhaps after an appropriate break admittedly.